Forest habitat animals at Northwest Trek: skunk, fisher, wolverine, badger. Deep inside the Northwest Trek forest, there’s another forest – a habitat filled with native woodland animals right next to the trail. 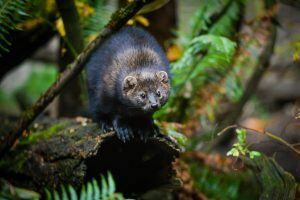 Find agile fishers, curious skunks, badgers and prickly porcupines next to wetland animals like river otters and beavers. WHAT: Dark brown to almost black, with an upper body covered in barbed quills between guard hairs, and stiff bristles below. It has four clawed toes on the forefoot and five on the hind foot. SIZE: Length 2-3.5 ft.; height 1 foot; weight up to 33 lbs. EATS: Plants and inner bark of trees. BABIES: Breeding in late fall. After a 6-month pregnancy the female gives birth to one porcupette weighing 12-20 oz. 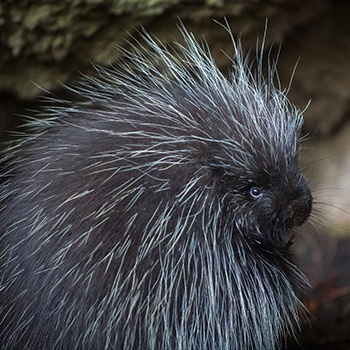 FUN FACTS: When threatened, a porcupine protects itself by climbing or fleeing. If cornered, it erects its quills, turns its rump toward the source of danger and rapidly lashes out with its tail. The quills are not thrown or shot but must come in contact with skin or other objects to detach. WHAT: One of the weasel family, fishers have a long body and short legs. Most are dark brown, but can be tan to almost black. WHERE: Dense, mountainous forests in North America. SIZE: Length 2.5-3 ft.; height 9-10 in. ; weight 4-12 lbs. EATS: Small mammals, birds and amphibians, with some plant material and carrion. BABIES: Breeding from March-April. After a one-year pregnancy, females give birth to a litter of 2-4 kits weighing 2-3 oz. FUN FACTS: Fishers can be active day or night, covering territory in a circuitous manner to look for food. But they don’t like rain, and will den unless forced out by hunger. Meet Minnie! She’s confident- even a bit sassy, says keeper Miranda Mauck. Fishers are North America’s fastest tree climber, rapidly scaling trees to hunt prey. They’re also very quick, and good jumpers. Their speed and agility make them the primary predator for porcupines, and help them defend themselves against larger predators. WHAT: Skunks have a bold white head patch dividing into a V-stripe extending to their tail over a black coat. They have small ears, long fur and large bushy tails. WHERE: Meadows to forests across North America. SIZE: Length 2 ft.; height 6-8 in. ; weight 4-10 lbs. EATS: Invertebrates, small mammals, reptiles, amphibians, eggs and plants. BABIES: Breeding from February-March. After a 9-week pregnancy, females give birth to 4-7 young weighing about ½ ounce. 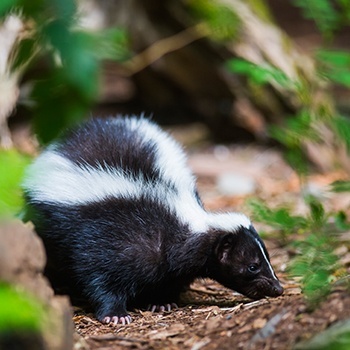 FUN FACTS: Striped skunks are left alone because their black-and-white coloring sends a clear message about their scent even to color-blind animals. When alarmed, a skunk will stamp its front feet, turn its back on the threat, raise its tail and fire caustic scent accurately up to 12 feet. Skunks den up and become semi-dormant in cold areas, often together in “snuggles” of one male and several females. 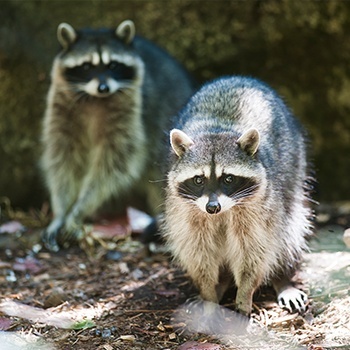 WHAT: You can recognize a raccoon by its ringed tail and black facemask. Its grizzled coat varies in color depending on region. WHERE: Southern Canada and most of the U.S. SIZE: Length 3 ft. (including tail); height 9-10 in. ; weight 15-18 lbs. EATS: Anything they find or capture, especially aquatic animals. BABIES: Breeding from January-February. After a 60-day pregnancy the female gives birth to 2-5 kits, weighing 2-4 oz. FUN FACTS: Raccoons are very curious animals, handling and investigating almost everything they discover. Their extremely sensitive forepaws are their main tool for analyzing potential food, often from water. This dexterous manipulation can look a little like they are washing their food. 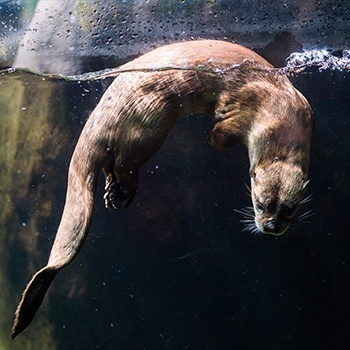 WHAT: River otters are members of the weasel family, adapted for water living. They have streamlined bodies, short legs with webbed hind feet and a smaller skull. WHERE: Fresh and salt water that doesn’t freeze throughout North America. SIZE: Length 3.5-4.5 ft. (including tail); height 7-9 in. ; weight 15-20 lbs. EATS: Fish, small mammals, birds, reptiles, amphibians, invertebrates. BABIES: Breeding from June-July. After an 8-month pregnancy the female gives birth to 2-7 young, weighing less than ½ pound. FUN FACTS: Otters are among the most playful of mammals: they chase, slide and play with objects. Near den entrances, otters often twist tufts of grass together to use as scent stations to mark territory or attract mates. Unlike other members of the weasel family, otters are sociable, living in family groups and sometimes traveling with another family. 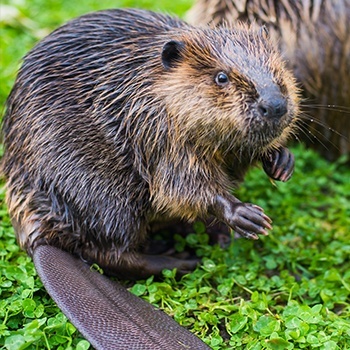 WHAT: Beavers are large rodents, with blonde to black fur. They have small ears and eyes, and a long, horizontally flattened, paddle-shaped and scaly tail. WHERE: Forested areas with fresh water across North America. SIZE: Length 4 ft.; height up to 12 in. ; weight 40-60 lbs. EATS: Leaves, bark, stems and roots. BABIES: Breeding from January-February. After a 3-month pregnancy, females give birth to 2-3 kits that weighs about one pound. FUN FACTS: Beavers are communal animals that live in family groups. When kits reach 2 years old they are driven off. They are active anytime, but usually nocturnal around humans. When alarmed a beaver will slap its tail on the surface of the water, creating a loud warning for others. Beavers are engineers, second only to humans in their ability to alter their environment. They work together to construct elaborate dams and lodges to create ponds or wetlands. appearance and distinctive white stripe from nose to back. SIZE: Length 2 –2.5 ft.; weight 15 to 20 lbs. EATS: Small mammals, reptiles, birds, invertebrates and occasionally plants. BABIES: Breeding June-July. After a 7-week pregnancy, females give birth to 2-7 young, which weigh less than ½ lb. 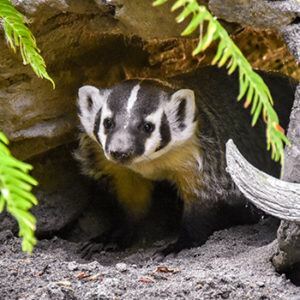 FUN FACTS: Badgers excavate. They dig to find prey, to escape danger, and to survive winter temperatures. They’re known for solitary behavior and aggressiveness. When cornered badgers will snarl, expose their teeth, and sometimes snap their jaws together. Although not true hibernators, they will den up during cold weather. They were orphaned near Ellensburg. Now, badger sisters Poppy and Lavender have found a home.